Environmental education plays an important role in the preservation and further development of the unique natural environment around Lüneburg Heath Nature Park. Rare species and the special flora of the Heath can only be protected if knowledge about it is also available to the human population. Lüneburg Heath Nature Park has a comprehensive and diverse environmental education and nature programme for young and old, individuals, families and school classes. 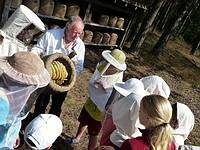 Whether with the Nature Park explorers in the Nature Park summer camp, school classes on a school trip, or with friends on a guided tour through the Nature Park, Lüneburg Heath Nature Park offers exciting nature experiences - at any time of the year. On the following pages, we would like to present our environmental education and nature experience offers. Take your time - it's worth it!